Yesterday Walmart announced the installation of six more solar projects in Denver, Colorado, bringing the total number of Walmart’s solar power installations to 100. The rooftop solar installations, built in a partnership with SolarCity, are enough to power 225 homes annually. Walmart and SolarCity say that these projects will prevent 5 million pounds of carbon dioxide from entering the atmosphere. The retail giant’s long term goal is to use clean energy at all of its American stores and distribution centers. SolarCity has been Walmart’s largest partner in this effort, with 75 projects completed between them and 49 more on the drawing board. The new installations should provide 3 million kilowatt hours of electricity a year. SolarCity and Walmart team up through a power purchasing agreement (PPA) arrangement. SolarCity installs the solar systems for free and then owns and maintains them. Walmart then only pays for the power generated at a rate equal to or lower than the cost of electricity from the local utility. Such a working relationship allows Walmart to incrementally scale its renewable energy agenda without investing large sums of money that would catch the attention, and possible ire, of its shareholders. So far Walmart has been installing the solar plants where the sun is plentiful. 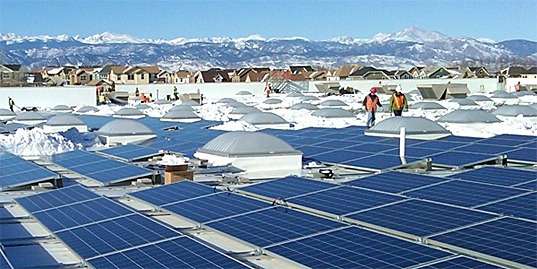 In addition to Colorado, SolarCity has built rooftop solar power stations at Walmart stores in Arizona and California. 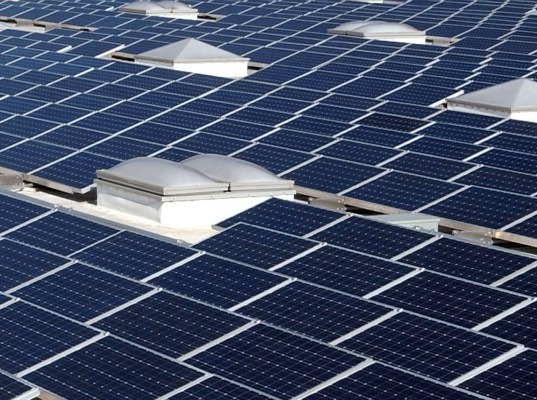 By 2013, 130 stores, 75 percent of the company’s locations, will run solar. Meanwhile in Texas, wind is the preferred renewable energy source. But the slow shift away from fossil fuels, according to SolarCity’s Tobey Corey, goes beyond Walmart. If a company of Walmart’s reach can prove that renewable energy like solar can scale and work, other companies could be pushed to do the same on more of their rooftops, too.